Look at these bullets. 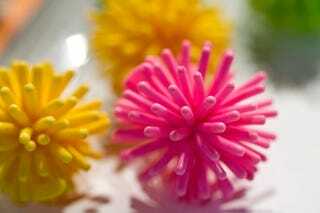 They're rubbery, less lethal,"almost incapable of penetrating the body," and happen to resemble Koosh balls—a popular toy. Getting shot with these must be fun. I'm kidding. I don't really think getting shot by anything would be fun, but it's really difficult to believe that "[t]his may be the most intelligent way to defend your family against home intruders." Especially when the "WARNING: Keep out of reach of children" is distracting me.